Accredited TCO-Certified Training Partners provide courses and certification exams on their online Learning Management Systems. Students register with the training organization, take the courses and exams, and are awarded their TCO Certificate by the training partner. Sales affiliate programs are provided directly by training partners. 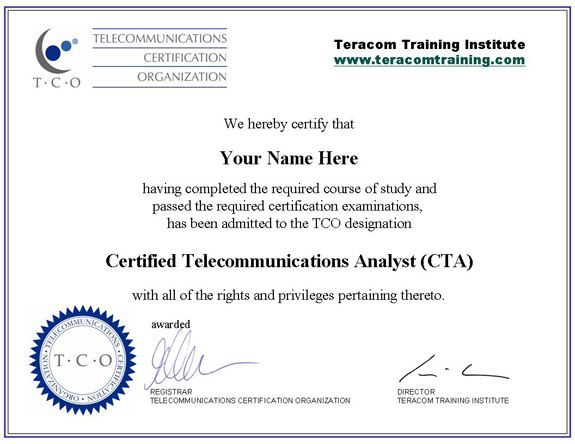 Teracom Training Institute is the leading provider of telecommunications training in the USA and Canada. In business for over 20 years, Teracom's clients include AT&T, Verizon, Bell Canada and TELUS, the CIA, NSA, IRS, FAA, US Army, Navy, Marines and Air Force, hundreds of other companies ranging from Oneida Tableware to the RCMP and thousands of individuals. Teracom has built a solid reputation for delivering high-quality training programs that consistently rated "excellent". TCO Certification Exams from all training partners are hosted on the myTeracom Learning Management System. Teracom Training Institute's online Learning Management System (LMS) will guide you every step of the way, from registration for your Certification Exam, to sitting for the exam and delivering your Certificate suitable for framing and letter of reference to prospective employers. Full instructions are provided as you proceed, including "help" pages with detailed instructions, like this one for the dashboard. It's fun and easy to use and provides you with complete control of your learning and certification experience. Rest assured that full privacy and security are implemented in this professional Learning Management System. Your information, including your email address, remains strictly private. Communications are encrypted, and the server is scanned monthly to ensure it is in current compliance with strict Payment Card Industry security standards. Join the TCO affiliate sales program, advertise Online Courses and Certifications on your website, and earn a commission on every student you refer who registers for Online Courses and Certifications!